For Sarasota students, the last day of school is June 6 and for Manatee County school kids, the last day is May 31. YMCA summer camps begin in Sarasota on June 7 and in Manatee County, on June 5. There are so many options for a summer camp experience at the Sarasota and Manatee county YMCA’s that they won’t all fit in our pages! Let’s just say that you-name-it, they have it: Arts to UK-style soccer, adventure to tennis, gymnastics to swim, ‘kinder’ to teen, leaders and lifeguard, expeditions and sports and that’s not the half of it. But it’s not just the Y’s that provide great summer camps: community centers and churches, youth clubs and parks. Here’s some contact information for a curated list Fit941 thinks may be a great fit for you and your kids, but by no means includes all summer caps – and there are plenty! So, here you go and have the best summer ever! Sarasota YMCA’s Best Summer Ever Camp list includes the Wild about Florida ‘Incredible Camp’ – where kids go off-site and visit local parks and beaches and other cultural and recreation venues — and a plethora of active, adventure and sports camps – swimming, tennis, gymnastics, soccer, basketball and lots more – keep kids happy and healthy. The Y website includes a color brochure with great camp descriptions and all the how-do’s and must-do’s. Learn more by visiting SarasotaYMCA.org/camp. 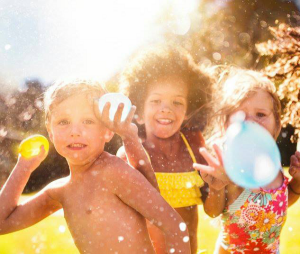 State College of Florida’s Kids’ Summer Spectrum Camp is a recreational and educational summer camp for children ages 7-13 with activities including arts & crafts, cooking, science and computer classes, along with sports like kickball and volleyball and much more. Students may register for morning sessions, afternoon sessions, or both, with supervision provided at lunch time. Morning care is available at SCF Bradenton and SCF Lakewood Ranch for an additional fee. There’s also a Computer & Technical Camp for at SCF Lakewood Ranch. For more information, call SCF at 941-752-5203 or visit SCF.edu and click on Corporate/Community, and then Kids Summer Spectrum. Sarasota Youth Sailing’s Summer Camp is the longest running water sports camp in Sarasota, and as it says on its website, “many of our parents/grandparents and instructors grew up in our program.” Camp is held rain or shine; if the weather is bad, activities are held in a sheltered area. That said, summer is hurricane season so if there’s a ‘cane or tropical storm, camp be forced to close. For beginners to savvy teen sailors learning to race, this is one cool camp. Visit SarasotaYouthSailing.org/summersailing for more information.